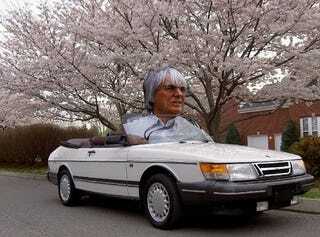 Will Bernie Ecclestone Buy Saab? Formula One’s overlord has teamed up with a Luxembourg private investment company to submit a bid to GM to buy Saab. But does the General think the bid's credible? Ecclestone’s financial partner in the bid, Genii Capital, is the same company which has assumed a majority stake in Renault’s Formula One team last fall. “It’s a good brand that has probably been neglected by the current owners. We don’t own it yet, so let’s see what happens,” Ecclestone told the Bloomberg news agency after the bid was confirmed. Parallel with Ecclestone’s effort is a new bid by Spyker, the Dutch supercar shop, whose former bid to buy the company was unsuccessful. If things go well and mirror a previous operation run by Ecclestone in the 70s, expect to see Saabs with giant fans to create downforce which will disappear after a day. The Saabs, not the downforce. On the other hand, nobody in business life is closer in spirit to Darth Vader than Bernie—and we all know Saab knows a thing or two about manufacturing vehicles to suit the taste of powerful Sith lords. So is Bernie's bid a real shot at ownership of the quirky Swedish brand? As long as he's got the money. "It's real easy. Just show up with the money, and you can have it," GM CEO and Chairman Ed Whitacre told reporters Wednesday. But, "No one's showed up with the money." So there you go. Bernie can have 'em if he can pony up the necessary cash to make a deal happen.